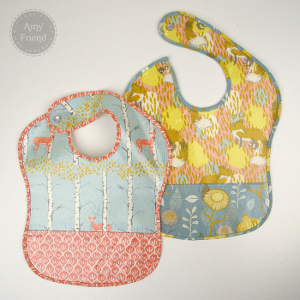 Mothers will love these iron-on vinyl Sweet Baby Bibs for their little ones. 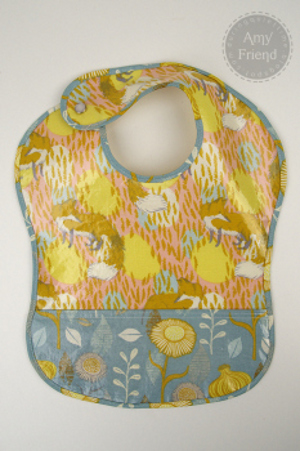 Whether you are making this project for a little boy or girl, these Sweet Baby Bibs are the perfect quilted gift pattern because you can personalize the design and colors of your fat quarter quilt patterns to laminate onto these beautiful baby bibs. No matter if you are making this easy baby quilt for your own child or as a quilted gift, you'll love how the sweetest thing about this adorable bib is that it is easy for parents to clean! 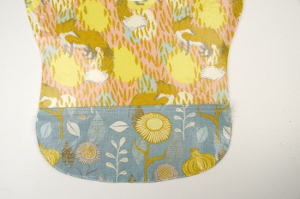 Begin by printing out your pattern pieces. The pdf file can be downloaded here. Apply the vinyl following the directions on the packaging. 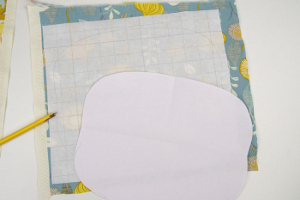 Because you don’t want pinholes in your laminated fabric, I suggest tracing your pattern pieces onto the paper backing which will cling to the laminate while you cut. Do the same with the pocket pattern piece, using your contrasting print. 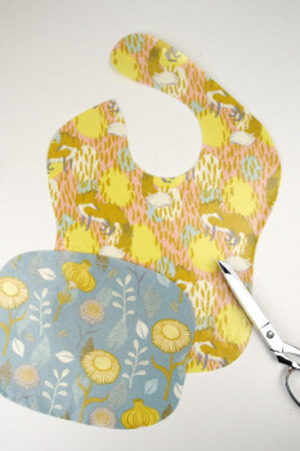 Next, cut your pieces and pull off the protective sheet to reveal your laminated fabric pieces. 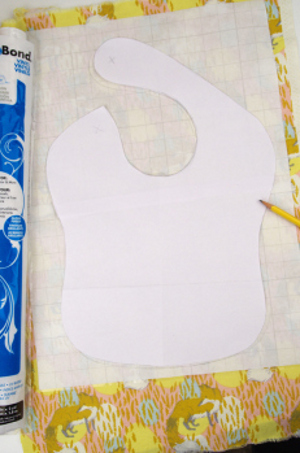 Fold your bib pocket along the fold line (Remember not to iron directly onto the laminate, use that protective paper!). Using a Teflon presser foot or an ultra glide foot, top stitch along the upper edge of the pocket. Use two rows of stitching for a more professional look but it isn’t necessary. Stay stitch the pocket in place along the very edge. Next, prepare approximately 60″ of half inch binding by folding it in half and ironing it. You can use a Clover Bias Tape Maker in the 1/2″ size to make your own coordinating bias tape. Begin applying the binding at the upper left neck edge as shown in the picture above. Carefully work your way around the bib. 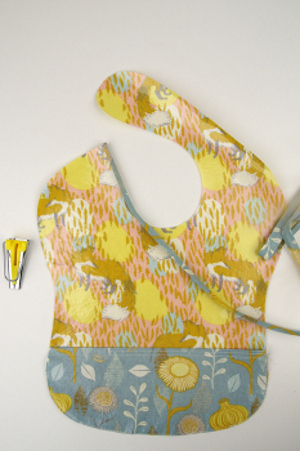 Finish off your bib by adding a snap using a Dritz snap fastener kit in the 7/16″ size.